The Yakers Himalayan Yak Milk Dog Chew is an irresistible and uniquely flavoured dog chew made from a mix of skimmed Yak and Cow milk for a delicious taste and an extremely long-lasting treat. Yakers find their origin in the hills of the Himalayas. Originally made for human consumption, they are still widely eaten by the Himalayan people and their dogs. They are made from a mix of skimmed Yak and Cow milk. A very small amount of lime juice and salt is added to coagulate (harden) the milk, which is then compressed into blocks and smoke dried for 28 days to give the chews their unique flavour. 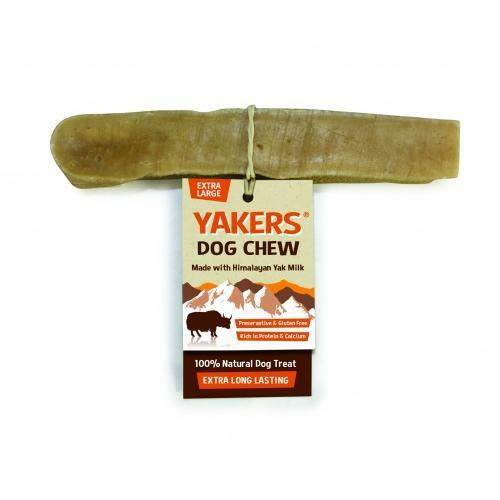 Depending on the size of your dog – as well as how determined he or she is – Yakers can be an extremely long-lasting treat. The hard texture means dogs need to soften and work at the treat before they’re rewarded with small pieces to chew off. So you get to keep them happily entertained for a lot, lot longer. You can also put the small end pieces in the microwave for 30 to 60 seconds until they puff up. Allow to cool and then give back to your dog to finish the treat. Yak and Cow milk (99.9%), Lime Juice & Salt.